This past February, I was able to check off "visiting the continent of Australia" from my must-see travel list. Even better, I cruised from Singapore to Sydney, Australia with Azamara Club Cruises. Known as the world’s smallest continent, yet largest island, Australia is smaller than the United States in land mass. The U.S. is 10 million square kilometers (when Alaska and Hawaii are included) while Australia measures 7.7 million. Most of the population of Australia live along the coast. The coastal climate is temperate and there is adequate rainfall for farming as opposed to the interior, or Outback, which is a desert. There are varied landscapes along the coast, as well, such as forests. Additionally, the coast provides bays and inlets for easy fishing. Most of the population speaks English, and other languages include Mandarin, Italian, Arabic, Greek, Cantonese, and Vietnamese. And yes, Australians do eat crocodile and kangaroo meat. Though I didn’t partake in dining on crocodile or kangaroo, I did see them up close. Amazing creatures. Koalas. Note I did not say “Koala bears.” Koalas are marsupials, like kangaroos. This means they are born undeveloped, then carried and suckled in a pouch on the mother’s stomach. They are not bears, even though they do kind of look like bears and they like to sleep a lot. Estimates put the dwindling koala population at less than 80,000. Local governments list the marsupial’s status as vulnerable or rare. Interestingly, the United States has classified the koala as endangered. Number one reason for the plummeting number of koalas: loss of habitat and eucalyptus trees, their diet staple. The Great Barrier Reef. The Great Barrier Reef is the largest living organism on Earth. 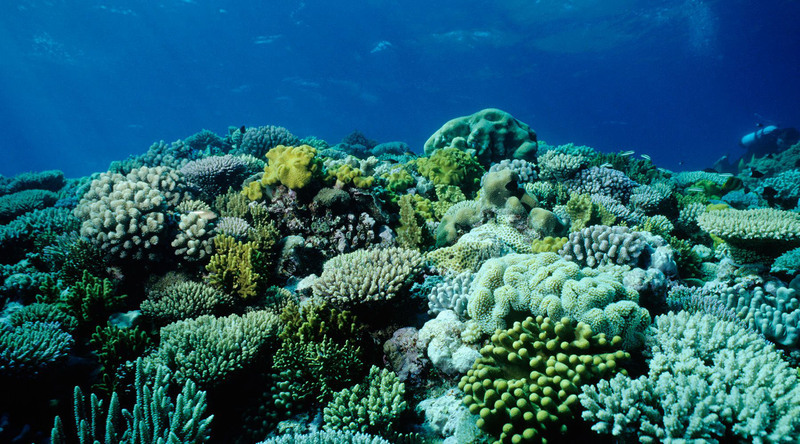 Truly a wonder of the world, it is made up of 2,900 individual reefs and can be seen from outer space. So many species make their home at the Great Barrier Reef – whales, dolphins, porpoises, sea turtles, birds, sea snakes, fish, and coral, among so many other animals. The color spectrum of all these creatures is unbelievable. The “Reef” was quite a unique experience. It was paradise for scuba divers. (I don’t scuba dive, but it was such a different activity for me.) A catamaran docked beside our Azamara cruise ship sailed us directly to the Great Barrier Reef for a day of snorkeling. What a unique touch! Service doesn't get more personal than that. When we arrived at the unsung hero of the Great Barrier Reef – the double decker pontoon where you could just chill and watch fellow passengers snorkel – most folks went scuba diving. It was a lifetime dream for some, while others took the submarine to observe the fluorescent fish that are visible from above water, too. Truly a wonder of the world. Check out the video here. It was quite the adventure to sail from Singapore to Australia! All in all, I traveled to four continents (Asia, Australia, Europe, and North America) and to six countries (Japan, Singapore, Indonesia, Australia, Great Britain, and the U.S.) in less than a month. Whew! I look forward to sharing more of my travel adventures with you. Which continent or country would you like to check off your bucket list? Please share!